You are currently browsing the category archive for the ‘Life on Maple Avenue’ category. My father-in-law was a retired contractor who really knew his business, He, Dewey, and my mother-in-law-, Bernice, lived some sixty miles away and they volunteered to supervise the remodeling and addition to the house. When I protested that it would be too far for them to commutes, they informed me that they would move in with us until the job was finished. They were great people. But, I don’t think that any of us realized at the time how hair-raising the whole business would be, nor how long it would take. The kitchen remodeling was one of the first things that we tackled. My husband and I went to a reputable cabinet shop with our plans and went over them with the owner. We decided on a Birdseye maple wood and when the cabinets were finished he would call us. Then we could simply tear out the old cabinets and replace them with the new ones immediately. This sounded quite simple to me, and couldn’t inconvenience us too much in the process. Well, on the day that the workmen were to start on the kitchen, I came home from work, found a canvas covering the doorway into the kitchen. Now from my previous experience with canvas, I was naturally leery. I whisked back the canvas and stepped down to the kitchen just as a warning scream hit me. When I say that I went down into the kitchen, that is exactly what I did. As I raised up, I looked up in wonderment, not quite believing what I saw. The ceiling was gone as were the inside walls, the windows had all vanished, and naturally the floor had been taken out to complete the picture. My sprained ankle testified to the latter. I had expected the cupboards to be missing until they were easily replaced, but all this? It was Unbelievable. In all fairness, to everyone concerned, we had discussed how advantageous it would be to have more aesthetically placed windows in the kitchen and if we were to change the windows, we might as well have them all bigger than the previous ones. The walls had to be torn out to replace the antiquated wiring that would be totally inadequate for our modern kitchen. And the floor? Well it had to be checked for termites, was found to be weak anyway, so naturally it came out too. “My smile soon vanished as the couple at the door introduced themselves as the new pastor and his wife from our church, coming to call. I could easily have dropped dead with no regrets, but that would have been the easy way out. I graciously bade them enter, shoved over some clothes and a drawer for them to sit down, offered them some coffee, forgetting that I had no electricity to make any. I ended up serving them orange juice and cake, which probably had gone stale. (This had been my day to bake). The two of them sat primly, chatting pleasantly, and were the two most tactful people that I had ever met in my life. They acted as though every home was arranged as mine was that day. Neither blinked an eye or showed the mildest concern at the havoc. I had always been taught that the first step in being a good homemaker was to never apologize for the state of the home or the food, or any of the many things that could go wrong. I was temped to do some explaining, I’ll admit, until the moment passed that it might have done some good. For, at that dramatic moment, the half-chick awoke from his nap in the bedroom and came out into the living room, stretching and yawning, as only he could do. He went promptly to the front door to go out and “do his duty”. By then it was too late to have explained anything to this dear old diplomatic couple. I watched for some raised eyebrow, open mouth, gulps and so on, but neither gave any kind of reaction to the half-chick coming out of the bedroom, going to the front door to go outside. There wasn’t even a pause in the conversation. “One day, after an unusually strenuously work day, I drove home to find the house in a turmoil. Ted had decided to erect a fireplace on an outside wall of the living room. That sounds simple enough, but let me give you a picture of what I encountered as I walked through the living room that evening. Ted had ripped out the entire outside wall of the house and had nailed up a huge piece of canvas over the opening. It was the middle of winter but who would want a fireplace in the middle of summer? That was Ted’s reasoning, faulty as it was. A good portion of the floor was gone along with the wall, and Ted explained that he had to put a strong foundation in to hold up the fireplace. OK…then that was the reason for having the wheelbarrow full of cement in the middle of the floor. The rug was rolled up and stuck out at some ungodly angle across the room. Another wheelbarrow was filled with bricks and completed the picture of my otherwise neat living room. And, of course, the next day was my day off and the time to clean the house, wash, iron, bake, etc. Naturally, when I started to vacuum the following morning I wasn’t surprised to find that the electricity had gone off. Well, since I had an all electric kitchen, I was also unable to bake, wash, iron, etc. “What the heck this will be a great time to clean out drawers and closets” I told myself, undaunted by it all. Always the optimist! Since I had a growing daughter, there always seemed to be outgrown clothes to be sorted out. I had these outgrown clothes in one pile, clothes to be mended in another pile, clothes that needed bleaching in another pile, dirty clothes to be washed in another. All around the room there were dresser drawers that I hadn’t even touched yet when the doorbell rang. ﻿Dorothy loves her animals, but even tragedy has a lighter side. “One dark and quiet night about 12:30, a blood-curdling scream rent the air. Somehow I knew that one of our neighbor’s dogs had one of my ducks. We jumped up and ran to the back pasture. There, sure enough, was a neighbor’s dog dragging the poor drake through the fence toward home. Ted retrieved the duck, which was already dead, and told me to go into the house while he buried it. The other duck (the hen) stood around and cried the most pitiful wail ever thought possible. She grieved for her mate all night long, and the noise was most heart rendering. I knew what I had to do, so when I knew that my boss would be up in the morning, I called him to let him know that I would be late to work. I explained about the attack, the dog, and the grieving hen. My boss knew there was nothing to do but accept the situation as gracefully as he could. As soon as the wholesale producers would answer their phones, I began explaining my problem to them. All that any of them had to sell were frozen ducks. This would hardly serve the purpose. And all the while I could hear the grieving hen. This drove me on. I tried producer after producer, all with the inevitable offer of frozen ducks. I finally reached one woman who probably thought that I was slightly mad. She did have one young drake (alive) that she would sell to me. Naturally, she lived forty-five miles away. I hurriedly got in my car to drive after the new mate for my hen. When I arrived, the woman explained to me that all drakes do not appeal to all hens. I declared that it was worth the risk as she had the only one that was not frozen in Northern California. I paid for the drake and stuck him in a cardboard box with the lid open enough to admit air, put the box on the back seat of my station wagon, and drove off. 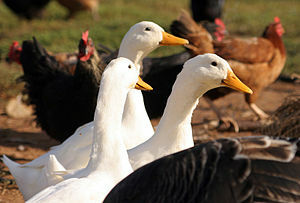 “My nephews, Poncho and John, went to the Fresno District Fair, and much to my sister Jackie’s consternation, won two baby ducks. They had no room or facilities for them so the most obvious solution would be to make a gift of them to Aunt Dorothy. Well, being me, I took one look at the little darlings and received them with open arms. These animals also weren’t quite normal, in the usual sense, but, by now, I more or less accepted this with my animals. The ducks loved to go into the kitchen, stand by the refrigerator and wait for Stella to give them some milk. They didn’t know that ducks do not drink milk. They also did not know that ducks did not sleep with seven year-old girls (under covers yet) until I caught them one night and made them sleep outside. “Half Chick became housebroke at an early age, loved to watch TV with us, and his favorite pastime of all to ride in the car with me, perched on my shoulder. He, in time, became a huge and beautiful White Leghorn. His head healed nicely, although only half of it was there. The skin grew around the crushed side of his head, although he never grew feathers there. Incidentally, we named him Half-Chick upon his ability to outlive that terrible accident. He had the choicest of food and received the best of care. “One beautiful early spring day our first year on the ranch I made a fatal decision. It all started guilelessly enough with an innocent walk through a shopping center, while spring fever surged through my veins. One display window in a feed store featured the sweetest, most precious looking day-old baby chicks imaginable. I thought to myself, “We have five acres of ground. If the chicks aren’t too expensive, I can buy several and we can have eggs of our own.” This sounded plausible to me as I went in to inquire the cost of the precious little darlings. 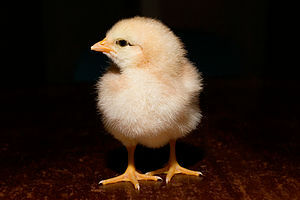 I was so amazed to learn that the chicks only cost a few cents each, so I wound up with one hundred and fifty chicks. I bought the suggested feed, several books on raising chickens, and made my way home. Upon arriving home, I found cardboard boxes, lined them with flannel, put in feed and water, and rigged up electric lights to keep them warm and installed my chicks in their new home. This happened to be in the confines of the pantry, as we had no other place for them. They were so small that they took up so little space. The following morning my sister Betty dropped over for a visit and I went into the pantry to get something, and emerged white-faced. Betty asked, What’s the matter? What happened? You look awful.” “I feel awful, Betty. I just stepped on the head of one of the baby chicks. Do me a favor and pick it up and put it in a little box, set it up on a shelf and Ted can bury it when he gets home.” I couldn’t even look at it I felt so terrible. I could feel its bones crunch as I walked on it bare foot. Being the person Betty was, she complied. “Really, Dorothy, it is alive and it looks good and strong to me, except for his poor little head,” Ted told me. “Come and have a look.” Against my better judgement, I looked and to my amazement, the chick was hopping around and looked great, except for his head.